Down the street from my place, there’s a Java U coffee shop across the street from Snowdon station. Last summer when I was studying for the MCAT, I went there regularly. The tip jar at this Java U always makes me smile. 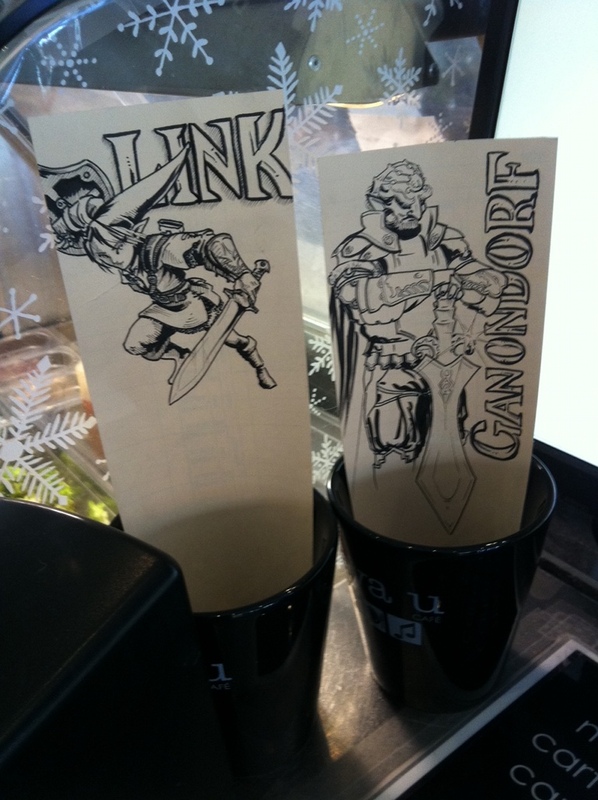 Someone who works at the coffee shop draws little illustrations—always in pairs—and puts each of the two in a coffee cup near the cash register. There’s always a question that goes with the illustrations. I’ve attached a couple examples. First is Link vs Ganondorf. I took a picture of this for the benefit of my little sister, who enjoys video games way more than I do. 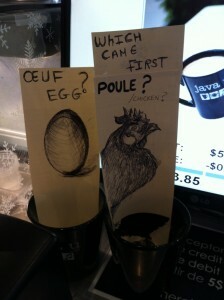 Next is “Which came first—Chicken or Egg?” And of course, there’s a drawing of both. The drawings and questions change fairly regularly, and there doesn’t appear to be any pattern. (That said, I don’t really come regularly enough or even remember the ones I have seen well enough to discern anything but the most obvious patterns.) At the end of last summer, the question was “Did you fall in love this summer?” accompanied by a “yes” and a “no” drawing (I’ll let you imagine what they were). The drawings must be done by someone who works at the particular coffee shop. They’re obviously not something sent from Java U’s corporate headquarters. I’m kind of curious to know if this is something that the artist spends a lot of time thinking about, or if it’s something that (s)he just draws up when business is slow. I looked through the book a couple times, just out of curiosity, but I could find no reference to these conditions or details. Oh well. Today, I will go through a couple of the practice exams on this section of the material, and go to the Financial Aid office at McGill to drop off the last of the OSAP forms. This is going to be the first time in a long time that I went downtown. I’ll bring my camera, in case something unexpected happens. 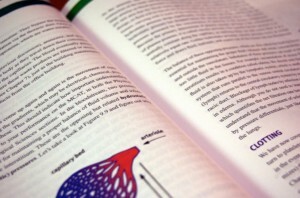 I have been studying for the MCAT using a set of books from Kaplan, an MCAT prep company, and I’ve realised a few things. First off, medicine admissions is big business. I’m not even talking about medicine. I just mean the admissions process. Imagine you just wanted to apply to all the medical schools in Ontario, for example. First you would have to write the MCAT. This will cost you $230. 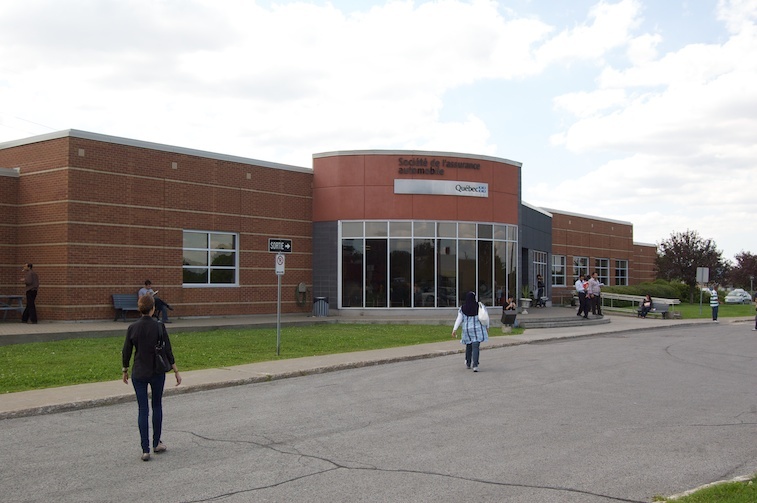 Then, you will need to pay for the application, and to apply to every school in Ontario through OMSAS, it will cost about $660. That’s $890 just to apply and take the MCAT. Now imagine that you want to take a prep course for the MCAT. I went shopping around for MCAT prep, and someone from Kaplan tried to sell me a comprehensive package which included one-on-one tutoring, online lectures, books, and practice exams. All told, the tutor would have been making roughly $180 per hour from me, and the package would cost me $2799. There is a whole industry built up around the fact that there’s huge competition to get into medical school. I ended up spending $150 for review books and practice exams, myself. I can understand companies like Prep 101 and Kaplan charging huge sums for their expertise and time. They are, after all, in the business of making money, and people (generally) are willing to spend money on investments that they think will bring a greater return in the long run. I have no problem with them. That said, there’s no way they are getting $2700 from me! I don’t care how good their tutor is. There’s no way he’s worth $180 an hour. Imagine knowing that your MCAT tutor is coming, and that you’re paying that much for him. I imagine I would spend as much time prepping for my meeting with the tutor as I would spend prepping for the MCAT, so that I would be sure to get my money’s worth, and that sort of mentality might not actually best help one to prepare for the MCAT. Anyway, I was thinking, and of course, I can understand wanting policies that make it difficult for someone to get into medical school. You don’t want an unqualified person committing surgery against a patient, after all. So you would want to produce a high intellectual barrier, or a high skill barrier, or otherwise make it difficult, but in ways that elminate the greatest number of people that should not be doctors. What’s confusing though, is why medical academia would have policies that produce such a high financial barrier to entry. The $890 is what you would pay if you were going for a bargain-basement medical school admission. That’s the minimum you would have to pay. You’re not buying any extra review material on that budget. You’re not getting any practice exams, tutoring or classes. That’s just what it costs to apply, and nothing more. Maybe it’s to weed out those who might just apply on a whim. Or maybe doctors don’t want new applicants to be spared any hardship they themselves had to suffer. Maybe it actually does cost that much to ensure that the process is fair. I’m not sure what the real reason is.